Hidden in the looping streets of the Wailuku Industrial Park lies a quaint oriental store, called TJ’s Warehouse. The name is unassuming of a Japanese store, but for more than a decade, TJ’s Warehouse has been selling Asian food products from a retail store located in the Maui Chemical and Paper Products building. 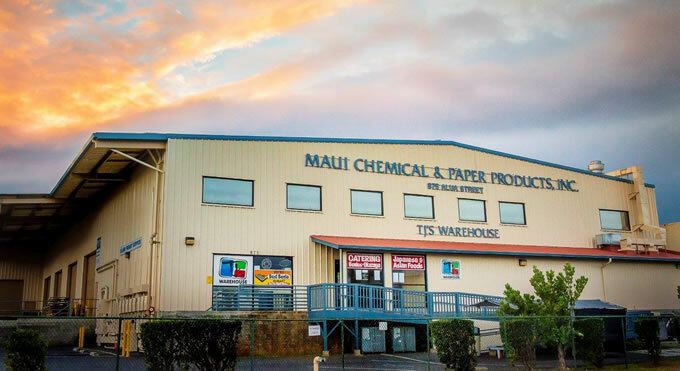 TJ’s Warehouse is a wholly owned subsidiary of Maui Chemical & Paper Products, Inc.
What many people do not know, is that besides selling cleaning chemicals and paper products, Maui Chemical has distributed Asian food products for many years. Their customers include supermarkets, grocery stores, restaurants and other retailers. Because of this, Maui Chemical has also been able to sell these same types of products in their retail store, TJ’s Warehouse. With the closing of Shirokiya, Ooka Supermarket and the tragic fire at Ah Fook’s Supermarket, TJ’s Warehouse has tried to address the needs of the local & Asian community by offering a large assortment of Asian food products. They carry small appliances like rice cookers, kitchenware, Japanese snacks, canned goods, frozen seafood, a variety of locally made products, pickled vegetables, and hot prepared foods in their retail store. In 2005, TJ’s Warehouse built a commercial kitchen to start selling bentos (box lunches). No one knew at that time what a hit that would be. They started with making only a dozen or so a day, which was purchased mostly by their employees. However, word soon spread and more people started coming in specifically for the food. TJ’s now produces hundreds of bentos a day and operates an okazuya line with plate lunches and hot prepared foods. Aside from bentos and an okazuya line, TJ’s has also incorporated a seafood department with an assortment of prepared poke and fish within their retail store. TJ’s has expanded its food service to offer catering platters and pans and custom made bentos for every occasion.